Today's topic at Armchair BEA is Nurturing Relationships. One of the reasons I got into blogging was to connect with other people. A few years ago I started a personal blog, but was so shy about sharing my life with people that I didn't really make any connections. When I got involved with book bloggers through my job, I realized this was a way I could meet people and share something I love. Today, I want to share with you just one relationship I have built since becoming a book blogger. I comment occasionally on blogs, but most of my relationship building is done through Twitter. Recently, I started chatting pretty regularly with a group of book bloggers. The conversation started out with just 2 or 3 of us, but rapidly grew to 5. 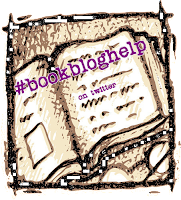 We couldn't fit much conversation in with all the twitter names so we came up with a hashtag - #BookBlogHelp. Since creating the hashtag we have had several other bloggers join us from time to time. Some contribute and others just lurk. Cait of The Cait Files, Neri of In the Name of Books, Teresa of Teresa's Reading Corner, Aimee of Coffee Table Reviews, and me originally started the chat. However, we love for other bloggers to join us whenever they can and use the hashtag without us. Some of us have just started blogging in the last few months, while others have been blogging for longer. I hope the other bloggers will stop by to introduce themselves in the comments, but if not you can check out their blogs by clicking on the links above. Also I have linked their names to their Twitter accounts. #BookBlogHelp is basically an impromptu chat where we give and receive blog help specific to book bloggers. We have chatted about what memes work the best or the most fun, layout/design issues, the use of labels, and our opinions on wordpress versus blogger. We also share tips and tricks that we have learned along the way, such as how to make a clickable link when leaving a comment. We really just wanted to have a place on Twitter where book bloggers could meet up and chat about anything. We span many time zones so it seems one or two of us are around at any time. If you have a question or want an opinion just @ one of us and use the hashtag #bookbloghelp; we would love to chat with more of you! Oh, and if you don't know how to chat on Twitter the easiest way is to go to tweetchat.com. You just log on using your twitter account and then enter the hashtag. You'll see the whole conversation and don't have to remember to add #bookbloghelp with each tweet as it is done automatically. I really think Twitter has helped Book Bloggers network and build relationships with one another. I use Book Blogs as well, but have met most bloggers through Twitter. I hope to meet up with at least some of the bloggers I have connected with in real life. Any of you going to be Indie Book Event at the end of July? I'll be there. I hope you join us (or start your own) in our next #bookbloghelp chat. I would like to thank Aimee for making the graphic for us. I completely agree that Twitter has helped with building relationships. I love the idea of #bookbloghelp (and remember seeing it a little while ago) so I will be checking in. That was a great post and I think that most of the things I learned about blogging has been from other bloggers. The #bookbloghelp chats that we have had were great and I learned a lot of valuable information such as giveaways,layout, and review policy. I try to get on their as much as I can to help anyone who has had questions. I just wanted to say thanks about letting me know about tweetchat that's the first time I heard about it. I will definitely use this. Thank you so much for sharing #bookbloghelp (and the tidbit about tweetchat). I will be sure to check it out. I think I must take a look at your twitter tag and see what's going on. I find Twitter somewhat overwhelming and confusing even though I sometimes get good leads to information and stories there. I still haven't really figured out Twitter yet. I know, I know, I just find it to be a bit too much! I was wondering if there was a hashtag for this topic. Thanks!